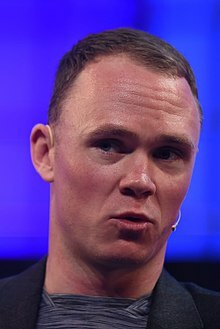 Christopher Clive Froome, OBE (born 20 May 1985) is a British road racing cyclist, who currently rides for UCI WorldTeam Team Sky. Considered by many[who?] as one of the greatest stage racing cyclists of all time. He has won all of cycling’s three grand tours. This includes four editions of the Tour de France (in 2013, 2015, 2016 and 2017), the Giro d'Italia in 2018 and the Vuelta a España in 2017. Froome has also won two Olympic bronze medals in road time trials, in 2012 and 2016, and also took bronze in the 2017 World Championships. Froome was born in Kenya to British parents, and grew up there and in South Africa. Since 2011 he's been a resident in Monaco. At the age of 22, Froome turned professional with Team Konica Minolta. In 2008, he joined the team Barloworld. The same year he moved to Italy, and started to ride under a British licence. In 2010, he moved to Team Sky and has since become one of the team's key cyclists. Froome made his breakthrough as a Grand Tour contender during the 2011 Vuelta a España where he finished second overall. At the 2012 Tour de France, riding as a super-domestique for Bradley Wiggins, Froome won stage seven and finished second overall, behind Wiggins. His first multi-stage race win came in 2013, in the Tour of Oman, followed by wins in the Critérium International, the Tour de Romandie, the Critérium du Dauphiné, and the Tour de France. In the 2014 Tour de France, he retired after multiple crashes. In 2015, he won his second Critérium du Dauphiné and his second Tour de France. He won a third Tour de France in 2016 and became the first man since Miguel Indurain in 1995 to successfully defend his title. He won his fourth Tour de France in 2017, followed by successive wins at the 2017 Vuelta a España and the 2018 Giro d'Italia, his first victories in both races. These achievements made him the first cyclist to win the Tour–Vuelta double since the Vuelta was moved to September, and the first to hold all three Grand Tour winners' jerseys at the same time since Bernard Hinault in 1983. After finishing primary school at the Banda School in Nairobi, Froome moved to South Africa as a 14-year-old to attend St. Andrew's School, a publicly funded school in Bloemfontein and St John's College, a boarding independent school in Johannesburg. Whilst in South Africa he was the school's cycling captain and kept in contact with Kinjah. He then studied economics for two years at the University of Johannesburg. In South Africa Froome started to participate in road cycling. On one of his school holiday, his home club gifted him with a second hand yellow jersey, being unaware of the Tour de France, he failed to see the significance. It was not until he was 22 that he turned professional. Froome started road racing in South Africa, specialising as a climber. Froome competed for Kenya in the road time trial and the road race at the 2006 Commonwealth Games in Melbourne, where he finished 17th and 25th respectively, catching the attention of future Team Sky principal Dave Brailsford: "The performance he did, on the equipment he was on, that takes some doing... We always thought he was a bit of a diamond in the rough, who had a huge potential." While representing Kenya at the 2006 Road World Championships in the under-23 category in Salzburg, Austria, Froome crashed into an official just after the start of the time trial, causing both men to fall; although neither was injured, he finished in 36th place. Froome's appearance at the Worlds came about after he impersonated Kenyan cycling federation president Julius Mwangi by using Mwangi's email account to enter himself into the Championships, in order to add some European racing experience to his CV and boost his chances of obtaining a contract with a professional team. 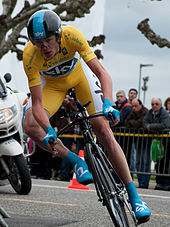 Froome turned professional in 2007, aged 22, with the South African team, Konica Minolta, withdrawing from university two years into his degree in economics. He competed from April to September in the U23 Nations Cup for the Union Cycliste Internationale's World Cycling Centre (WCC) team based in Aigle, Switzerland. In May he rode his first stage race, the Giro delle Regioni, winning stage five, riding for WCC. In late-May he won stage six of the Tour of Japan, attacking from a breakaway in the fourteen-lap circuit in Shuzenji. In June he competed at the "B" world championships in Cape Town, placing second to China's Haijun Ma in the 26.8-kilometre-long (16.7 mi) time trial. In July, he claimed a bronze medal in the road race at the All-Africa Games in Algiers, Algeria. On 26 September, he placed forty-first in the under-23 time trial at the world championships in Stuttgart, three minutes and thirty seconds behind the gold medalist, Lars Boom of the Netherlands. 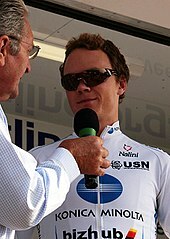 Froome was introduced to the British-based, South African-backed, second-tier UCI Professional Continental team, Barloworld, by South African Robbie Hunter, signing with them for the 2008 season. In March he finished second overall in the Giro del Capo in South Africa, one minute and forty-one seconds behind his teammate, Christian Pfannberger. Over April and March, he rode the Critérium International, Gent-Wevelgem and the Ardennes classics. In May 2008, Froome switched from a Kenyan licence to a British licence, to have a chance of riding in the 2008 Olympic Games, where Kenya did not qualify. He made his Grand Tour debut when he was named in Barloworld's squad for the Tour de France – becoming the first participant born in Kenya, in which he finished 84th overall and 11th among the young rider classification. In October Froome finished fourth overall in the Herald Sun Tour in Victoria, Australia. His performances in 2008 attracted the attention of British Cycling coach, Rod Ellingworth, who believed Froome had potential. Froome said: "Although I was riding under the Kenyan flag I made it clear that I had always carried a British passport and felt British. It was then we talked about racing under the Union Flag, and we stayed in touch." Froome claimed his next professional win in March 2009, with the second stage of the Giro del Capo in Durbanville, South Africa, attacking a ten-strong breakaway with 30 km (18.6 mi) and finishing four minutes ahead. He then participated in the Giro d'Italia, in which he came 36th overall, and seventh young rider classification. In July he won a minor one day race, Anatomic Jock Race, in Barberton South Africa. In September 2009, it was announced that he was to join British cycling team, Team Sky, for the 2010 season. Froome rode the 2010 Giro d'Italia. On stage nineteen, he was suffering with a knee injury and on the Mortirolo Pass he was seen holding on to a police motorbike. He had been dropped by the gruppetto, and intended to reach the feed zone and retire from the race. For holding on to the motorbike he was disqualified from the race. During his first season with Sky, his best result was at the Tour du Haut Var, where he finished ninth in the overall standings. He also finished second at the 2010 national time trial championships, showing his ability in the discipline. In October he represented England at the Commonwealth Games, in Delhi, coming fifth in the 40-kilometre-long (25 mi) time trial, two minutes and twenty seconds behind the winner, Scotland's David Millar. The early highlights of Froome's 2011 season were top fifteen finishes in the Vuelta a Castilla y León and the Tour de Romandie. Froome had a mixed Tour de Suisse, riding with the lead group on some mountain stages yet losing time on others, and finishing ninth in the final time trial. Froome entered the Vuelta a España as a domestique for Bradley Wiggins. Wiggins gave him credit for his ride in stage nine, where he helped Wiggins gain time on his rivals. The following day in stage ten, however, Froome out-rode Wiggins to finish second in the time-trial behind HTC–Highroad's Tony Martin and to take an unexpected lead in the race. Froome averaged 405 watts over 56 minutes in this time-trial, proving himself as a strong time-trialist. During stage eleven he helped his team neutralise some attacks but soon found himself unable to follow the main group. However, he managed to hang on to second place in the general classification. After losing the jersey to Wiggins on stage eleven, Froome continued to ride in support of his leader. On stage fourteen, he helped to drop rivals including Liquigas–Cannondale rider Vincenzo Nibali and Joaquim Rodríguez (Team Katusha) on the final climb. Wiggins credited his lead to Froome, in a stage which also saw Froome rise back up to second in the standings. On the tough stage fifteen which ended on the Alto de L'Angliru, stage winner Juan José Cobo (Geox–TMC) took the overall lead. Froome finished in fourth place, forty-eight seconds behind Cobo, and retained his second place in the overall strandings. On stage seventeen, Froome attacked Cobo 1 km (0.6 mi) from the summit finish, but Cobo fought back, catching Froome in the final 300 metres, only for Froome to attack again to win the stage and arrive one second in front of Cobo. As a result of time bonuses, Froome reduced Cobo's lead to thirteen seconds. Froome was unable to reduce Cobo's lead any further and finished second overall in the Vuelta, equalling Robert Millar's second places in the 1985 and 1986 editions of the Vuelta and the 1987 Giro d'Italia, as the best finish by a British rider in the Vuelta and the highest finish by a British rider in a Grand Tour. There was an inconsistency about him. The question wasn't why he was good, the question was why we'd only seen glimpses. Why isn't he like that all the time? When the illness was discovered, retrospectively, it made a lot of sense. David Brailsford on Froome's bilharzia infection. Later that year, it was revealed Froome had suffered throughout the year from the parasitic disease schistosomiasis, after having picked up the disease during a visit to Kenya in 2010. The discovery and subsequent treatment of the illness has been used to explain Froome's rapid rise in form during 2011. On 16 September 2011, Froome signed a new three-year contract with Sky. He was part of the Great Britain team that helped Mark Cavendish win the world road race championship. In October, Froome finished third overall in the first edition of the Tour of Beijing, 26 seconds behind overall winner, Tony Martin. The early part of Froome's 2012 season was wrecked by illness. He withdrew from the Volta ao Algarve with a severe chest infection, and blood tests showed the schistosoma parasites were still in his system. In March, while on a training ride, Froome collided with a 72-year-old pedestrian. He returned to racing in May, for the Tour de Romandie, where he helped Wiggins win the race overall, before participating in a training camp on Mount Teide in Tenerife with several of his teammates. Froome was selected for the Sky squad for the Tour de France. After placing 11th in the prologue, he suffered a punctured tyre 9 mi (14.5 km) from the end of stage one and lost over a minute to overall leader Fabian Cancellara (RadioShack–Nissan). On stage three, Froome was involved in a crash on the hill-top finish in Boulogne-sur-Mer, and was sent flying into safety barriers, but was unharmed and was given the same finishing time as the winner, Peter Sagan of Liquigas–Cannondale. On stage seven finishing atop the Category 1 climb to La Planche des Belles Filles, he protected his leader Wiggins and was part of a small group that came in sight of the finish line. Cadel Evans (BMC Racing Team) attacked, Froome jumped on his wheel and won the stage with an advantage of two seconds over his leader and Evans. Froome took the lead in the mountains classification. With that operation, he took the polka dot jersey, but lost it to Fredrik Kessiakoff of Astana the very next day. Froome finished second to Wiggins on stage nine, an individual time trial, and moved up to third overall. On stage eleven to La Toussuire, Froome attacked the remaining group on the last climb, 4 km (2.5 mi) before the finish line. He subsequently received the order from his team manager to hold back and wait for yellow jersey Wiggins. He finished third on the stage. For his efforts in assisting Wiggins, Froome was lauded in the media as a super-domestique. [not in citation given] On stage seventeen, Froome and Wiggins finished second and third respectively on the final mountain stage to further cement their general classification positions, although Froome repeatedly waited for Wiggins on the final climb, costing him the chance of winning the stage. On stage nineteen, a time trial, Froome finished second to Wiggins, mirroring the overall standings. Wiggins went on to win the tour with Froome second, becoming the first two British riders to make the podium of the Tour de France in its 109-year history. Froome, along with Sky teammates Wiggins, Cavendish and Ian Stannard, as well as Millar (Garmin–Sharp) were selected for Team GB's road race at the Olympic Games. Froome and Wiggins also contested in the time trial. 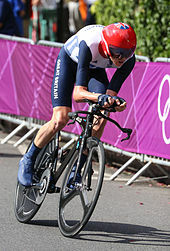 Froome won bronze in the time trial, with teammate Wiggins taking gold. Froome was selected as Team Sky's leader for the Vuelta a España, where he aimed to go one better than 2011 and win his first Grand Tour. He lay third after the first mountain finish on stage three, and moved up to second on stage four after leader Alejandro Valverde crashed, losing 55 seconds to the chasing group. Froome moved down to third during the stage-eleven time trial sixteen seconds off leader Rodriguez. He lost another twenty-three seconds on stage twelve, putting him 51 seconds down. He struggled through the rest of the second half of the race. He ended up fourth overall, finishing over ten minutes behind the race winner, Alberto Contador (Saxo Bank–Tinkoff Bank). Froome's 2013 season began at the Tour of Oman, where he took the race lead on stage four, finishing second to Rodríguez on the summit finish of Jebel Akhdar. Froome then won the following stage to extend his lead, out-sprinting Contador and Rodríguez. He finished the race taking the overall classification, his first stage race win of his career, 27 seconds ahead of Contador, with Cadel Evans twelve seconds further back. He also won the points classification. Froome then led Team Sky at the Tirreno–Adriatico in March, where he won the fourth stage after countering an attack by Contador, Astana rider Nibali and Vini Fantini–Selle Italia's Mauro Santambrogio on the final climb to Prati di Tivo. Froome lost time on eventual winner Nibali on the penultimate stage, finishing the race in second place. Froome returned to action, and to the top step of the rostrum, in the Critérium International. After finishing fourth in the short second-stage time trial, he passed teammate Richie Porte to win the third and final stage. In so doing, he overtook Porte in the general classification. In late April, Froome won the 7.5 km (4.7 mi) prologue of the Tour de Romandie in Le Châble, Switzerland, taking the leader's jersey, with a six-second gap over Andrew Talansky of Garmin–Sharp. He remained in the yellow leader's jersey throughout the entire race, increasing his advantage over his rivals to almost a minute with a strong performance in the penultimate queen stage. Near the end of that stage, after losing his support riders in the peloton, Froome gave solo chase to breakaway Team Katusha rider Simon Špilak and after catching him, worked with the Slovenian to maintain and extend their lead on the peloton and improve their general classification standings. Špilak won the stage, which catapulted him into second place in the overall, with Froome on his wheel in second. In the final individual time trial stage Froome took third place, increasing his lead and winning his third race of the season. Froome's final warm up race before the Tour de France, for which he was favourite, was the Critérium du Dauphiné at the beginning of June. He sat second overall behind Garmin–Sharp's Rohan Dennis after coming third in the time trial on stage four. Froome won stage five after countering a late attack by Contador, to take the race lead by 52 seconds over teammate Porte. Froome helped Porte solidify his second place on stage seven, and on stage eight the pair rode away from their rivals on the final climb, with only Talansky (Garmin–Sharp) able to follow. Froome took second on the stage behind Alessandro De Marchi of Cannondale, who had attacked earlier, to secure overall victory, with Porte completing a one-two, 58 seconds back. This was Froome's fourth major stage race victory of the season, out of the five he had entered. Froome's Tour de France got off to a nervy start as he crashed in the neutral zone of the first stage on the isle of Corsica, but he was unharmed. Also, he avoided going down in the large crash towards the end of the stage. After staying out of trouble for the rest of the first week, Froome won stage eight, the first mountain stage of the race, finishing on Ax 3 Domaines, by launching an attack after teammates Peter Kennaugh and Porte had brought back an earlier attack by Movistar Team's Nairo Quintana, and distanced most of Froome's rivals. Froome's winning margin on the stage was 51 seconds over Porte, and 85 seconds to Valverde (Movistar Team) in third. This gave Froome the overall lead in the Tour for the first time and the lead in the mountains classification. On the following stage, however, Froome was left isolated as no teammates were able to follow repeated attacks early in the stage by Garmin–Sharp, Movistar Team and Saxo–Tinkoff riders. Despite being without any team support for most of the stage, Froome was able to defend his lead by following several attacks by Quintana and Valverde. Froome then finished second in the individual time trial on the twelfth stage, twelve seconds behind Tony Martin, to put further time into all of his rivals. However, on stage thirteen Saxo-Tinkoff caused a split in the peloton due to strong crosswinds, which Froome missed. Saxo–Tinkoff's Contador and Roman Kreuziger, and Laurens ten Dam and Bauke Mollema of Belkin Pro Cycling all made the selection and took 69 seconds out of Froome's lead, although Valverde lost over ten minutes and slipped out of contention. Froome beat Nairo Quintana to win stage 15 of the 2013 Tour de France. Froome won stage fifteen, which finished on Mont Ventoux. Kennaugh and Porte dropped all of the leading contenders except Contador on the early part of the climb, before Froome surged clear of Contador with 7 km (4.3 mi) remaining and caught Quintana, who had attacked earlier in the climb. The pair worked together to put time into their rivals, before Froome dropped Quintana with 1.2 km (0.7 mi) remaining and soloed to the finish. This gave Froome a lead of four minutes and fourteen seconds over Mollema in second place, with Contador a further eleven seconds back. Froome also regained the lead in the mountains classification. He won the stage seventeen time trial, finishing the 32 km (20 mi) course from Embrun to Chorges in 51 minutes 33 seconds, with Contador coming in nine seconds behind him, in second place. Froome defended his lead during the Alpine stages, extending his overall lead as Mollema and Contador dropped back. Froome won the general classification on 21 July with a final time of 83 hours, 56 minutes and 40 seconds; he was 4 minutes and 20 seconds ahead of second-placed Quintana. He was also King of the Mountains for six stages; however, he ultimately finished second to Quintana in that classification. Froome's overall win and stage victories in the Tour win put him at the top of the UCI World Tour ranking, with 587, ahead of Sagan on 409. Partly because[according to whom?] the 2013 Tour was the first since Lance Armstrong's admission of doping, such questions were asked of Froome. He insisted that he and his team were clean and stated that the questioning saddened him. Froome was drug tested during the Tour and Team Sky principal Dave Brailsford offered the World Anti-Doping Agency all performance data they had on Froome as evidence. In October Froome was named winner of the prestigious Vélo d'Or award for the best rider of the year. As defending champion for the first time, Froome started his 2014 season by again winning the Tour of Oman. After some minor illnesses and back problems, which meant he missed Tirreno–Adriatico, his next stage race was the Tour de Romandie, again as defending champion, which he won by 28 seconds ahead of Špilak, with the two riders placing first and second in that race for the second consecutive year. He also won the final stage of the race, an 18.5 km (11.5 mi) individual time trial, finishing a second faster than three-time time trial world champion Martin. To celebrate the Tour de France moving from Britain to France in July, Froome rode a bicycle through the Channel Tunnel, becoming the first solo rider to do so and one of few cyclists ever to have made the journey. The Crossing took under an hour at a top speed of 40 mph – faster than most cross-channel ferries. Froome crashed out on the fifth stage of the Tour de France after falling three times over two days, putting an end to his defence of his Tour de France crown. He came back in time to duel with Alberto Contador on the Vuelta a España. He lost time on the first individual time trial. Before the last stage, a short (10 km) flat time trial, Froome was in second place with a deficit of 97 seconds on the Spaniard. He finally finished second. He was also awarded the overall combativity award. Following his 2013 and 2014 early-season victories in the Tour of Oman, Froome decided to begin his 2015 racing season in February at the Ruta del Sol in Spain. He was joined there by Contador, both riders competing in this race for the first time. Having lost eight seconds to Contador in the first day's individual time trial, Froome ceded even more time to him on the third stage, when the Spaniard broke away from the peloton during the uphill finish to win the stage. Now 27 seconds behind Contador, with only one mountain stage remaining, Froome seemed likely to end up second. But on the penultimate fourth stage, which had a steep uphill finish, Team Sky worked hard and dropped all of Contador's Tinkoff-Saxo teammates as the leaders reached the final climb. After some punchy moves by his support riders, Froome began a solo attack. For a short time Contador was able to follow, but he soon fell away. Froome won the stage and was able to open a 29-second gap on second-place Contador by the finish line, enough to overcome his deficit and take the overall race lead by two seconds. The final fifth stage was relatively flat, with no likely chance for Contador to make up his deficit, allowing Froome to collect his first stage race victory since May 2014. This was the third year in a row that Froome won his season opener stage race. For the second year in a row, Froome did not start Tirreno–Adriatico, due to a chest infection. He participated in the La Flèche Wallonne but crashed badly, ruling him out of a victory. Still, after some time to regain his wits, he remounted and soldiered on to finish 123rd, at 12:19. He later participated in the Tour de Romandie in hopes of winning it for the third year in a row, but had to settle for third place in the general classification after winner Ilnur Zakarin and second-place Simon Spilak, both of Team Katusha. In June, he was in full preparation for the Tour de France as he participated to the Critérium du Dauphiné. He won stage seven, the queen stage, thanks to two consecutive attacks on the last climb of the day, one to shed the leading group and another one to get rid of Tejay van Garderen, who had resisted the first one. On the stage, he repeated the exploit of winning solo while putting enough time into van Garderen to win the overall classification as well. Froome entered the Tour de France as one of the favourites for the overall win. After a strong performance on the Mur de Huy Froome took over the race lead by one second from Tony Martin, although he subsequently lost the jersey to Martin on stage four to Cambrai. 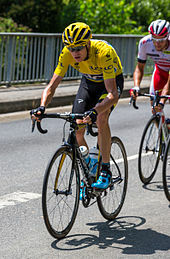 Following Martin's retirement from the race with a broken collar bone sustained in a crash near the end of stage six Froome was promoted to race leader, but declined to wear the yellow jersey during stage seven. During the evening of the first rest day of the Tour, it emerged that the team had had some of Froome's data files hacked and released onto the internet. As the Tour entered the second week of racing stage ten saw the first mountains stage, the summit finish of La Pierre Saint-Martin, where Froome would go on to take the stage win, putting significant time into his general classification rivals. During the remainder of the race the team faced intense scrutiny regarding their dominant performances; Porte was punched in the ribs by a spectator in the Pyrenees, and Froome claimed he had urine thrown at him by another spectator, who Froome described as 'clearly French', and levelled his blame for the poor spectator behaviour on the press for 'irresponsible journalism'. Team Sky then released some of Froome's power data from stage ten in an attempt to calm claims of blood or mechanical doping. Froome maintained his lead during the final week's Alpine mountain stages, although he lost 32 seconds to Quintana, who had emerged as his principal rival, on the penultimate mountain stage to La Toussuire, and another 86 seconds on the final summit finish on Alpe d'Huez, giving him a lead of 72 seconds over Quintana in the general classification. In addition to winning the race overall he clinched the mountains classification. In August, Froome confirmed that he would follow up his Tour win by riding in the Vuelta a España. Froome lost time on his rivals on the first summit finishes, though he gained back some time on the summit finish of stage nine. Stage eleven was a mountainous stage in Andorra that Froome had described as "the toughest Grand Tour stage I’ve ever done". He crashed into a wooden barrier on the approach to the first climb of the day; he continued to the end of the stage, though he lost significant time on all his rivals. The following morning, an MRI scan revealed that he had broken his foot in the crash and he withdrew from the Vuelta. Froome was appointed Officer of the Order of the British Empire (OBE) in the 2016 New Year Honours for services to cycling. Before the 2016 season, Sky announced that Froome would attempt an unprecedented triple goal: the Tour, as well as the time trial and road race at the Olympics. Froome started the season early, competing in the 2016 Herald Sun Tour in Australia (a race in which he had finished fourth in 2008). The Herald Sun Tour consisted of a short individual time trial prologue, followed by four stages. On the last stage, which culminated in a triple climb of Arthurs Seat and a summit finish, Froome broke away in a solo attack on the third and final ascent, and opened up a sufficient gap on the field to secure his first 2016 victory, along with the King of the Mountains award. Froome's next racing appearance was at the Volta a Catalunya in late March, where he finished eighth overall. He subsequently competed at the Tour de Romandie, which brought mixed results. On the second stage, he punctured on a climb 20 km from the end and finished 17 minutes down on stage winner and new race leader Nairo Quintana. However, on stage four, the queen stage, he and Tejay van Garderen attacked from the bunch to join the day's original breakaway; the pair then rode away on the final climb, and Froome distanced van Garderen with 7.4 km to go, holding on to win the stage with a four-second lead over the leader's group. In June, as preparation for the Tour de France, he took part in the Critérium du Dauphiné, which he won by 12 seconds over Romain Bardet of AG2R La Mondiale. This was Froome's third victory at the Dauphiné over the last four years. On Stage 8 of the 2016 Tour de France, Froome attacked on the descent of the Col de Peyresourde and held off the leading group of GC contenders to take a solo victory in Bagnères-de-Luchon. By doing so, Froome took the Yellow Jersey, leading the race by 16 seconds over Adam Yates (Orica–BikeExchange). Following the stage, Froome received a fine of 200 Swiss Francs for elbowing a spectator in the face who had run alongside him during the ascent of the Col de Peyresourde. He further surprised people on stage 11 to Montpellier when he finished second in a sprint to Peter Sagan, after being part of a 4-man break in the final 12 kilometers after the peloton split due to crosswinds. On Stage 12, on the ascent up Mont Ventoux, Froome collided with Richie Porte and Bauke Mollema and a motorbike after spectators on the road forced the motorbike to stop. Porte and Mollema continued riding, while Froome ditched his bike and continued on foot until receiving a replacement bike from his team car. He finished the race 1 minute and 40 seconds behind Mollema, but was awarded the same time as Mollema after a jury decision, and retained the yellow jersey. He followed with superb results in both of the individual time trials with a second-place finish on stage 13 and winning stage 18. 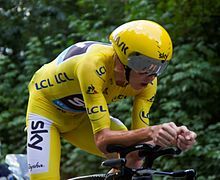 Froome went on to claim his third Tour de France victory on 24 July 2016, and became Britain's first ever three-time winner of the race. He followed his Tour win with a bronze medal at the 2016 Rio Olympics, during the Men's Time Trial event, repeating his bronze medal success from London 2012. After the Olympics he was named in the start list for the 2016 Vuelta a España, during which he helped the team win the opening team time trial and later won stage 11 on Peña Cabarga, the site of his first Grand Tour victory in 2011. He lost over 2 and a half minutes on stage 15 when rivals Nairo Quintana and Alberto Contador attacked together from kilometre 10 and blew the race apart, isolating him from his teammates. However, Froome continued to fight on and managed to gain back nearly all he had lost in a dominant victory on the stage 19 individual time trial to Calp. He finished the Vuelta in second overall, only 1:23 back of Quintana, earning his second Grand Tour podium of the season. Froome won his fourth Tour de France title on 23 July 2017. He beat Rigoberto Urán by 54 seconds. Although Froome never won a stage during the 2017 Tour or any prior race during that calendar year, he was victorious thanks to his exceptional time trialing abilities showcased on the Grand Depart in Düsseldorf and on stage 20 in Marseille. On 19 August, Froome started the Vuelta a España aiming to win it having finished 2nd on three occasions previously and had gone in as the overwhelming favourite. On stage 3 Froome attacked up the final climb with only Esteban Chaves able to follow him. However, they were pegged back on the descent and Vincenzo Nibali won the stage in the reduced sprint. Froome finished 3rd and the bonus seconds at the line plus those he picked up at the intermediate sprint were enough to see him take the red jersey for the first time since 2011. He went on to win stage 9 at Cumbre del Sol (the same finish where he lost to Dumoulin in 2015), also taking the lead in the points classification in the process. Despite a crash on stage 12, he recaptured the lead in the points classification with a 5th-place finish on stage 15 to Sierra Nevada and won the stage 16 individual time trial at Logroño, also taking the stage's combativity prize. A third-place finish on the Alto de l'Angliru cemented the red jersey as well as the combination classification, and in a thrilling finish on the sprint stage at Madrid, held on to win the points classification by 2 points over Matteo Trentin. With the victory, Froome became the first British rider to win the Vuelta, the third man to successfully complete the Tour-Vuelta double in the same year joining Jacques Anquetil and Bernard Hinault, and the first man to achieve the feat since the Vuelta moved to its current position on the racing calendar. He then competed at the 2017 UCI Road World Championships in Bergen only about a week after his Vuelta victory and won two bronze medals: one in the men's team time trial with Team Sky, the other in the men's individual time trial for Great Britain. On 17 October 2017, he won his third Vélo d'Or award as the best rider of the 2017 season. Following the leaking of test results to the Guardian and Le Monde newspapers, the newspaper article stated that ' [this] ...threatens to damage his reputation as one of Britain's most successful athletes.' His team were asked to explain the high levels of the drug revealed in the test, and if not adequately explained it would have resulted in a ban from the sport. His case has been widely criticised by fellow cyclists and in January 2018 UCI president David Lappartient recommended that he was suspended by Team Sky until his case was resolved. In February 2018 David Brailsford defended Froome saying "For me, there's no question, he's done nothing wrong – no question, no question, no question." He went on to say that he believed Froome was innocent and that he felt the case shouldn't have been made public. On 2 July 2018, the UCI officially closed the investigation into Froome, stating that the rider had supplied sufficient evidence to suggest that "Mr Froome's sample results do not constitute an AAF". On 29 November 2017, Froome announced that he intended to participate in the 2018 Giro d'Italia in an attempt to complete the Giro-Tour double, marking his first start in the race since 2010. A win would make him the seventh rider to win all three Grand Tours, and the third rider to hold all three Grand Tour titles simultaneously in a single 12-month period. On 5 February 2018, Froome announced he would start his season with an entry into the Vuelta a Andalucía (Ruta del Sol), despite calls for him not to race until his case was resolved. However, there were also signs of support for Froome, with Ruta del Sol organiser Joaquin Cuevas claiming it to be "a pleasure and an honour" to have Froome in the race, and Mauro Vegni, the organiser of the Giro d’Italia, commenting that 'If he [Froome] wins the pink jersey, he’ll always be the winner for me'. Cyclingnews also reported that Froome would be likely to compete in two Italian pre-Giro stage races: Tirreno-Adriatico and the Tour of the Alps. Froome (right) on the Colle delle Finestre on Stage 19 of the 2018 Giro d'Italia shortly before his decisive solo attack. Froome entered the 2018 Giro d'Italia as one of the favourites to take the overall victory in Rome at the end of May. Once at the start of the Giro d'Italia, he was he would be cleared of his offences. However, before the race could even begin Froome crashed whilst performing a recon of the opening time trial in Jerusalem. Froome would finish the time trial in 21st place, ceding 35 seconds to overall rival Tom Dumoulin. After the race, Team Sky directeur sportif Nicolas Portal admitted that the injury Froome sustained in the crash was worse that they had stated at the time, and Brailsford said that the crash was a setback to Froome's physical condition, which the team felt was below the required level at the start of the Giro. By the end of the first summit finish on Mount Etna, Froome had risen to eighth overall, one minute and 10 seconds behind early race leader Simon Yates. On stage 8, Froome fell on his injured side when his rear wheel slid on a wet climb. By the end of stage 9 to Gran Sasso d'Italia, Froome had lost a further one minute and 17 seconds to Yates, dropping to 11th overall. Stage 10 could have also proven ominous when afterwards he admitted to feeling pain and an imbalance between his legs; and was glad to maintain his position. Froome's first signs of recovery came through on the most difficult climb of the race to that point, Monte Zoncolan, where he distanced all of his main overall rivals, taking the stage win. Froome's deficit to the maglia rosa was now 3'10". However, on the final climb of the following stage to Sappada Froome cracked, yielding more than a minute to the other main general classification contenders. Overall, Froome lay 4'52" from Yates, the leader, 2'41" from Domoulin, 2'24" from Domenico Pozzovivo and 2'15" from Thibaut Pinot. Froome's fortune began to change as the race entered the third week, with a strong performance in the 34 km, Stage 16 time trial – from Trento to Rovereto – finishing fifth on the stage, rising to fourth overall and moving to within four minutes of Yates. On stage 18 to Prato Nevoso Yates displayed the initial signs of weakness, cracking on the final slopes of the summit finishes and losing 28 seconds to all of his other general classification rivals. Stage 19 of the race had been classified as the 'queen stage' of the race, with three focused climbs in the latter half of the stage. These included the half paved-half gravel climb of the Colle delle Finestre, followed by the climb to Sestriere and the final uphill finish to Bardonecchia. On the evening before the stage, Team Sky's management decided that Finestre would be the ideal place to put pressure on Yates: if a team rode hard on the front, its 27 hairpin turns would create a concertina effect in the peloton, making it difficult for riders behind to follow, and forcing teams to shed their domestiques. Froome then planned to attack Dumoulin on the 8 km gravel section at the top of the climb. To ensure that Froome would be able to obtain the nutrition necessary to sustain such a long-range attack without carrying extra weight, the team commandeered all its staff at the race including Brailsford and Ellingworth themselves to ensure there were feeding stations every ten minutes up the Finestre. On the stage itself, the early breakaway, which included Froome's teammates Sergio Henao and David de la Cruz, was closed down by Yates' Mitchelton–Scott team just before the Finestre. Sky's climbing train set an extremely high tempo at the beginning of the climb: with Yates in difficulty on its lower slopes and with 80 km left of the stage, Froome launched a solo attack. Froome's advantage grew throughout the second half of the stage, culminating in him taking the stage honours. Importantly, a stage victory of more than three minutes which included picking up three bonus seconds at the second intermediate sprint in Pragelato resulted in Froome taking the overall race lead, 40 seconds ahead of the 2017 Giro d'Italia victor, Tom Domoulin. Taking the maximum amount of points on all three of the remaining climbs on the stage (Finestre, Sestriere and the Jafferau), Froome also moved into the lead in the mountains classification. His solo attack was likened to famous historical performances such as Fausto Coppi to Pinerolo in 1949, Claudio Chiappucci to Sestriere in 1992, Marco Pantani on the Galibier in 1998, Floyd Landis's long range attack to Morzine, and Michael Rasmussen to Tignes in 2007. Froome held on to the maglia rosa on the final 'true' day of racing for the GC, neutralizing several attacks by Dumoulin in the final kilometers before launching a counter-attack of his own, putting an additional 6 seconds into his rival at the finish line at Cervinia. Froome took victory in the 2018 Giro d'Italia making him the first British rider to win the overall title, the first rider since 1983 to hold all three Grand Tour titles simultaneously, as well as becoming the seventh man to have completed the career Grand Tour grand slam. He then went into the 2018 Tour de France as one of the main favorites for victory despite the mostly negative reactions from some fans. Crashing twice on stages 1 and 9 as well as looking vulnerable on several other stages, Froome then shifted his focus on helping his friend and longtime teammate Geraint Thomas in a super-domestique role. Thanks to a phenomenal[according to whom?] performance in the penultimate day time trial to Espelette, Froome finished third overall behind Thomas. Despite being defending champion of the Vuelta, Froome decided to skip the 2018 edition having ridden four consecutive Grand Tours. He instead rode the 2018 Tour of Britain in service of Wout Poels, a thank-you gesture to the teammate who had been there at his side for four of his six Grand Tour wins. It was the last race of his 2018 season, electing to skip the World Championships in Austria citing physical as well as mental fatigue to be the main reasons behind his decision. On 1 January 2019, Froome announced that he would not be defending his title at the Giro d'Italia, instead focusing on the 2019 Tour de France with the aim of winning the race for the fifth time. He started his season at Tour Colombia in February, and also rode the Volta a Catalunya in support of Egan Bernal. He has added the Tour of the Alps to his program, having already confirmed his participation in the Tour de Yorkshire prior to returning to the Critérium du Dauphiné. Froome has also confirmed that he will participate in the 2019 World Championships in Yorkshire in the fall. Froome was made an Officer of the Order of the British Empire (OBE) in the 2016 New Year Honours for services to cycling. Froome is currently an ambassador of the United for Wildlife conservation project. His bikes since stage 13 of the 2015 Tour have a rhino graphic on the top tube as a way to show awareness for the plight of the animal, also as an homage to his African roots. In 2017, he was named the ambassador of the Palace to Palace charity ride in support of The Prince's Trust as well as a Global Ambassador for Best Buddies, an organization based in Miami helping people with intellectual disabilities. Since winning his first Tour de France title in 2013, doubts over Froome's performances were raised by various experts, including former Festina coach Antoine Vayer. These allegations were based mainly on his sudden transformation from a relatively unknown rider to a Grand Tour winner, following his breakthrough performance in the 2011 Vuelta. After his dominant showing in the first mountain stage of 2015 Tour, the suspicions increased even further. In an attempt to answer these questions, Froome promised to undergo independent physiological testing soon after finishing the Tour. The test, arranged by Froome himself, took place shortly before the start of the Vuelta, on 17 August 2015, in the GlaxoSmithKline Human Performance lab in London. Several tests were carried to determine his maximum sustainable power for 20–40 minutes (threshold power), level of maximum oxygen consumption (VO2 max) and his peak power. Froome's peak power was measured at 525 W; his peak 20–40-minute power, at 419 W, corresponds to 79.8 percent of the maximum. At his current weight of 69.9 kg (154 lb) (of which 9.8% was body fat) at the time of test, this corresponds to a figures of 7.51 and 5.98 W/kg respectively. His maximum oxygen uptake was measured at 84.6 ml/kg/min. At the time, he was reportedly almost 3 kg (6.6 lb) heavier compared to his Tour weight of 67 kg (148 lb). Using this number, the VO2 max figure would translate to approximately 88.2 ml/kg/min. He also released results from a previous test, carried out in 2007 while being part of the UCI development programme. The 2007 test measured his peak power at 540 W, the threshold power at 420 W and the maximum oxygen uptake of 80.2 ml/kg/min, at a weight of 75.6 kg (167 lb). Froome and his wife have stated that, after cutting down on carbs and beginning to eat more proteins and healthy fats, he lost 20 pounds (9.07 kg) and his weight loss has allowed him to "thrive on the bike, especially in the mountains". Froome uses special non-round chainrings. ^ a b c "No. 61450". The London Gazette (Supplement). 30 December 2015. p. N12. ^ a b "Chris Froome leads Tour of Oman after second place in stage". BBC Sport. BBC. 14 February 2013. Retrieved 21 February 2013. ^ a b c "Chris Froome". Team Sky. BSkyB. Retrieved 4 June 2017. ^ "Chris Froome". ProCyclingStats. Retrieved 4 June 2017. ^ a b c d Chadband, Ian (27 June 2013). "The incredible rise of Chris Froome – and how he was almost killed by a hippo". The Daily Telegraph. Telegraph Media Group. Retrieved 28 June 2013. ^ a b Gallagher, Brendan (11 July 2012). "Chris Froome at the top as the race hits high notes in cruel mountain stages". The Daily Telegraph. Telegraph Media Group. Retrieved 24 August 2012. ^ Thomas, Steve (23 November 2011). "Underdog no more, Chris Froome hopes for a bit more liberty in 2012". VeloNews. Competitor Group, Inc. Retrieved 23 November 2011. ^ Fotheringham, Alasdair (13 July 2012). "Chris Froome zooms from riding with lions to pride of pack". The Independent. Independent Print. Retrieved 30 June 2013. ^ "BBC Radio 4 - Inheritance Tracks, Chris Froome". BBC. Retrieved 23 November 2018. ^ a b c d e f Bradford, D. (2018, December 6). The Mentor: David Kinjah. Cycling Weekly, pp. 8-10. ^ Fordyce, Tom. "Chris Froome: The making of a Tour de France champion". BBC Sport. Retrieved 6 June 2014. ^ McCallum, Kevin (28 June 2013). "Froome goes from St John's to Sky". Independent Online. Independent News & Media. Retrieved 1 July 2013. ^ a b Ingle, Sean (29 June 2013). "Chris Froome confident he can pull off victory in the Tour de France". theguardian.com. Guardian Media Group. Retrieved 30 June 2013. ^ Dickson, M. D. (16 September 2011). "Weekly Circular" (PDF). The Banda School. p. 1. Archived from the original (PDF) on 4 January 2014. Retrieved 22 July 2013. ^ Shapshak, Toby (15 February 2013). "Chris Froome aims to sweep clean at Tour". Mail & Guardian. Retrieved 30 August 2015. ^ a b c McRae, Donald (22 June 2013). "Chris Froome: Shaped in Africa and ripe for Tour de France win". The Observer. Guardian Media Group. Retrieved 30 June 2013. ^ "Newsletter" (PDF). St John's College. December 2011. Archived from the original (PDF) on 4 January 2014. Retrieved 17 August 2012. ^ a b Hood, Andrew (15 September 2011). "Chris Froome: Out of Africa and onto the Vuelta podium". VeloNews. Competitor Group, Inc. Retrieved 29 June 2013. ^ Slater, Matt (19 June 2013). "Tour de France: Chris Froome on bid to emulate Bradley Wiggins". BBC Sport. BBC. Retrieved 1 July 2013. ^ Shapshak, Toby (15 February 2013). "Chris Froome aims to sweep clean at Tour". Mail & Guardian. Anastacia Martin. Retrieved 21 April 2013. ^ "The Big Interview: Chris Froome". Cycling Weekly. IPC Media. 3 June 2008. Retrieved 28 June 2013. ^ Hood, Andrew (10 June 2013). "The story of Brailsford's Froome discovery dates back to 2006". VeloNews. Competitor Group, Inc. Retrieved 28 February 2015. ^ Farrand, Stephen (26 June 2013). "Chris Froome: From cycling slum dog to Monte Carlo millionaire". Cyclingnews.com. Future plc. Retrieved 30 June 2013. ^ "2006 UCI Road World Championships, Salzburg, Austria". Cyclingnews.com. Future plc. September 2006. Retrieved 4 July 2012. ^ "The smartest career move that Tour de France winner Chris Froome ever made was posing as someone else". Business Insider. Retrieved 31 May 2017. ^ a b c Westby, Matt (22 July 2013). "Tour de France: Chris Froome's journey up cycling's ranks comes to glorious end in Paris". Sky Sports. BSkyB. Retrieved 24 July 2013. ^ "Froome – a product of the WCC". Union Cycliste Internationale. 23 July 2013. Archived from the original on 24 July 2013. Retrieved 24 July 2013. ^ "Young Guns News Roundup #16D". Daily Peloton. 1 May 2007. Archived from the original on 19 April 2013. Retrieved 24 July 2013. ^ Gutowski, Stephanie (29 May 2007). "11th Tour of Japan – Stage 6 Recap". Daily Peloton. Archived from the original on 19 October 2007. Retrieved 23 January 2015. ^ "2007 UCI B World Championships". Union Cycliste Internationale. Archived from the original on 28 March 2010. Retrieved 23 January 2015. ^ "World Championship, Road, ITT, Elite B 2007". Cycling Archives. de Wielersite. Retrieved 24 July 2013. ^ "All African Games, Road 2007". Cycling Archives. de Wielersite. Retrieved 24 July 2013. ^ "Time Trial U23 Men results" (PDF). Union Cycliste Internationale. p. 2. Archived from the original (PDF) on 1 November 2013. Retrieved 24 July 2013. ^ "South African George wins time trial". Cyclingnews.com. Future plc. 8 March 2008. Archived from the original on 16 April 2014. Retrieved 23 January 2015. ^ a b c "Froome takes cycling's big step". Cyclingnews.com. Future plc. 21 November 2008. Retrieved 23 July 2013. ^ "2008 Standings". Tour de France. Amaury Sport Organisation. Archived from the original on 11 October 2012. Retrieved 12 July 2012. ^ Canning, Andrew (20 October 2008). "Monday's British news round-up". Cycling Weekly. IPC Media. Retrieved 24 July 2013. ^ "Team Barloworld's Froome opens his account at the Giro del Capo". VeloNation. 5 March 2009. Retrieved 24 July 2013. ^ "2009 Giro d'Italia results". Cyclingnews.com. Future plc. 31 May 2012. Retrieved 17 August 2012. ^ "[RSA] Anatomic Jock Race 2009". Cycling Archives. de Wielersite. Retrieved 24 July 2013. ^ "Foreign stars sign for Team Sky". BBC Sport. BBC. 10 September 2009. Retrieved 10 September 2009. ^ a b Farrand, Stephen (28 May 2010). "Team Sky's Chris Froome expelled from Giro". Cyclingnews.com. Future plc. Retrieved 18 July 2013. ^ Brown, Gregor (29 May 2010). "Chris Froome disqualified from Giro d'Italia". Cycling Weekly. IPC Media. Retrieved 24 June 2013. ^ "2010 Tour du Haut Var results". BikeRaceInfo. 21 February 2010. Retrieved 17 August 2012. ^ "2010 British Time Trial Championships". British Cycling. 5 September 2010. Retrieved 17 August 2012. ^ "Millar takes time trial gold in Delhi". Cyclingnews.com. Future plc. 13 October 2010. Retrieved 13 February 2013. ^ "Tour de Suisse". Team Sky. BSkyB. June 2011. Archived from the original on 29 June 2012. Retrieved 4 July 2012. ^ Fotheringham, Alasdair (29 August 2011). "Wiggins: A fantastic finish". Cycling Weekly. IPC Media. Retrieved 29 August 2011. ^ "Vuelta Stage 10 Time Trial by Chris Froome". TrainingPeaks. Retrieved 3 December 2015. ^ Lowe, Felix (31 August 2011). "Moncoutie on song as Wiggins takes red". Yahoo! Eurosport. TF1 Group. Archived from the original on 8 December 2015. Retrieved 4 July 2012. ^ McGrath, Andy (31 August 2011). "Wiggins takes Vuelta overall lead as Moncoutie wins stage". Cycling Weekly. IPC Media. Retrieved 24 March 2013. ^ MacLeary, John (3 September 2011). "Bradley Wiggins tightens grip on overall lead after Rein Taaramae wins on mountain top". The Daily Telegraph. Telegraph Media Group. ^ Turner, Jonathan (4 September 2011). "Froome and Wiggins second and third on GC". Sky Sports. BSkyB. Retrieved 24 March 2013. ^ "Chris Froome wins Vuelta a España 17th stage". BBC Sport. BBC. 7 September 2011. Retrieved 12 July 2012. ^ Bull, Nick (11 September 2011). 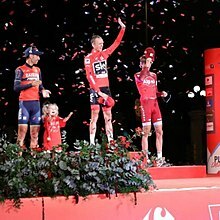 "Froome and Wiggins finish on Vuelta podium". Cycling Weekly. IPC Media. Retrieved 4 July 2012. ^ a b Hood, Andrew (16 July 2013). "Still living with bilharzia parasite, Froome says he has no drug exemptions". VeloNews. Competitor Group, Inc. Retrieved 24 July 2013. ^ a b "Froome still battling parasitic infection". Cyclingnews.com. Future plc. 25 April 2012. Retrieved 28 June 2013. ^ Drisdelle, Rosemary. "Chris Froome's Parasite – What is Bilharzia Anyway?". Decoded Science. Retrieved 24 July 2013. ^ "Chris Froome extends contract with Team Sky". BBC Sport. BBC. 16 September 2011. Retrieved 24 March 2013. ^ Gladstone, Hugh (25 September 2011). "Mark Cavendish wins World Road Race Championship". Cycling Weekly. IPC Media. Retrieved 12 July 2012. ^ "Tony Martin wins first-ever Tour of Beijing". China Daily. 10 October 2011. Retrieved 12 July 2012. ^ Bull, Nick (31 May 2012). "Froome the fighter". Cycling Weekly. IPC Media. Retrieved 8 June 2012. ^ "Froome hits pedestrian in Italian training accident". Cyclingnews.com. Future plc. 13 March 2012. Retrieved 8 June 2012. ^ "Wiggins crowned in Romandie". Team Sky. BSkyB. 4 May 2012. Archived from the original on 20 October 2012. Retrieved 28 June 2013. ^ Gallagher, Brendan (21 June 2012). "Team Sky confirm team that will support Bradley Wiggins and Mark Cavendish in pursuit of yellow and green". The Daily Telegraph. Telegraph Media Group. Retrieved 28 June 2013. ^ "Prologue – Liège > Liège". Tour de France. Amaury Sport Organisation. 30 June 2012. Archived from the original on 16 April 2014. Retrieved 28 June 2013. ^ Gallagher, Brendan (1 July 2012). "Peter Sagan wins first stage in sprint finish as Fabian Cancellara retains yellow jersey". The Daily Telegraph. Telegraph Media Group. Retrieved 28 June 2013. ^ Gallagher, Brendan (3 July 2012). "Peter Sagan wins stage three as Team Sky's Bradley Wiggins retains second place overall". The Daily Telegraph. Telegraph Media Group. Retrieved 28 June 2013. ^ Westemeyer, Susan (7 July 2012). "Froome leads double Sky success on La Planche des Belles Filles". Cyclingnews.com. Future plc. Retrieved 8 July 2012. ^ Robinson, Mark (8 July 2012). "Pinot rides to glory in Porrentruy". Cyclingnews.com. Future plc. Retrieved 8 July 2012. ^ "Bradley Wiggins strengthens grip on yellow jersey". BBC Sport. BBC. 9 July 2012. Retrieved 10 July 2012. ^ Ryan, Barry (12 July 2012). "Froome breaks from the script at La Toussuire". Cyclingnews.com. Future plc. Retrieved 12 July 2012. ^ Rodrigues, Jason (14 July 2012). "Tour de France 2012: domestique bliss for Team Sky's Chris Froome". theguardian.com. Guardian Media Group. Retrieved 16 July 2012. ^ Atkins, Ben (19 July 2012). "Tour de France: Alejandro Valverde climbs alone to Peyragudes victory on stage 17". VeloNation. Retrieved 27 July 2012. ^ Gallagher, Brendan (19 July 2012). "Team Sky's Chris Froome looks to future after sacrificing victory for Bradley Wiggins". The Daily Telegraph. Telegraph Media Group. Retrieved 27 July 2012. ^ "Bradley Wiggins on verge of first British win". BBC Sport. BBC. 21 July 2012. Retrieved 17 August 2012. ^ "Bradley Wiggins wins 2012 Tour de France". BBC Sport. BBC. 22 July 2012. Retrieved 17 August 2012. ^ "Millar Selected For Team GB Olympic Road Race Team". Cyclingnews.com. Future plc. 4 July 2012. Retrieved 27 July 2012. ^ "Men's road cyclists selected to Team GB for London 2012 Olympics". British Cycling. 4 July 2012. Retrieved 27 July 2012. ^ Wynn, Nigel (1 August 2012). "Wiggins wins gold in men's time trial, bronze for Froome". Cycling Weekly. IPC Media. Retrieved 1 August 2012. ^ "Olympic medallist Chris Froome leads Team Sky at Vuelta". BBC Sport. BBC. 16 August 2012. Retrieved 17 August 2012. ^ Bull, Nick (20 August 2012). "Valverde victorious as Vuelta GC has first shakedown". Cycling Weekly. IPC Media. Retrieved 22 August 2012. ^ Gladstone, Hugh (21 August 2012). "Rodriguez takes over lead after Valverde crashes". Cycling Weekly. IPC Media. Retrieved 22 August 2012. ^ Gallagher, Brendan (29 August 2012). "Alberto Contador leapfrogs Chris Froome to close in on Joaquim Rodríguez". The Daily Telegraph. Telegraph Media Group. Retrieved 13 September 2012. ^ McGrath, Andy (30 August 2012). "Rodriguez wins stage 12 to extend Vuelta lead". Cycling Weekly. IPC Media. Retrieved 13 September 2012. ^ "Alberto Contador wins second Vuelta a España title". BBC Sport. BBC. 9 September 2012. Retrieved 13 September 2012. ^ Gallagher, Brendan (15 February 2013). "Chris Froome claims stage win to retain leader's red jersey". The Daily Telegraph. Telegraph Media Group. Retrieved 15 February 2013. ^ Wynn, Nigel (16 February 2013). "Chris Froome wins the Tour of Oman". Cycling Weekly. IPC Media. Retrieved 16 February 2013. ^ Brown, Gregor (9 March 2013). "Chris Froome wins Tirreno-Adriatico stage four". Cycling Weekly. IPC Media. Retrieved 12 March 2013. ^ "Team Sky's Chris Froome beaten into second place by Astana's Vincenzo Nibali". The Daily Telegraph. Telegraph Media Group. 12 March 2013. Retrieved 12 March 2013. ^ Wynn, Nigel (24 March 2013). "Chris Froome takes final stage and overall win in Criterium International". Cycling Weekly. IPC Media. Retrieved 24 March 2013. ^ Wynn, Nigel (23 April 2013). "Chris Froome wins Tour de Romandie prologue". Cycling Weekly. IPC Media. Retrieved 23 April 2013. ^ Puddicombe, Stephen (27 April 2013). "Simon Spilak wins Tour de Romandie stage four as Chris Froome extends lead". Cycling Weekly. IPC Media. Retrieved 30 November 2015. ^ "Simon Spilak wins stage 4 of 2013 Tour de Romandie; Chris Froome defends overall". VeloNews. Competitor Group, Inc. 27 April 2013. Retrieved 30 November 2015. ^ Puddicombe, Stephen (28 April 2013). "Chris Froome wins Tour de Romandie". Cycling Weekly. IPC Media. Retrieved 21 July 2013. ^ Puddicombe, Stephen (31 May 2013). "Critérium du Dauphiné 2013: Who will win?". Cycling Weekly. IPC Media. Retrieved 28 June 2013. ^ Farrand, Stephen (5 June 2013). "Martin continues time trial winning streak in Dauphiné". Cyclingnews.com. Future plc. Retrieved 6 June 2013. ^ Devaney, Jason (6 June 2013). "Busche nearly nails Dauphine stage win at Valmorel". VeloNews. Competitor Group, Inc. Retrieved 6 June 2013. ^ "Chris Froome leads Dauphine as Sammy Sanchez wins stage seven". BBC Sport. BBC. 8 June 2013. Retrieved 8 June 2013. ^ Fotheringham, William (9 June 2013). "Chris Froome seals Critérium du Dauphiné victory in Risoul rain". theguardian.com. Guardian Media Group. Retrieved 9 June 2013. ^ "Chris Froome wins Criterium du Dauphine ahead of Tour de France". BBC Sport. BBC. 9 June 2013. Retrieved 9 June 2013. ^ Westby, Matt (30 June 2013). "Marcel Kittel takes yellow as stage-one chaos costs Mark Cavendish". Sky Sports. BSkyB. Retrieved 16 July 2013. ^ Westby, Matt (6 July 2013). "Chris Froome wins stage eight and takes yellow jersey in Pyrenees". Sky Sports. BSkyB. Retrieved 16 July 2013. ^ "Chris Froome in yellow after stage win". BBC Sport. BBC. 6 July 2013. Retrieved 16 July 2013. ^ Brown, Gregor (7 July 2013). "Daniel Martin wins Tour de France stage nine as Chris Froome fights to retain lead". Cycling Weekly. IPC Media. Retrieved 16 July 2013. ^ Fotheringham, William (10 July 2013). "Chris Froome extends lead over yellow jersey rivals in Tour de France 2013". theguardian.com. Guardian Media Group. Retrieved 16 July 2013. ^ "How Froome was outmanoeuvred". Yahoo! Eurosport. TF1 Group. 12 July 2013. Archived from the original on 8 December 2015. Retrieved 16 July 2013. ^ "Chris Froome wins stage 15 to extend lead". BBC Sport. BBC. 14 July 2013. Retrieved 16 July 2013. 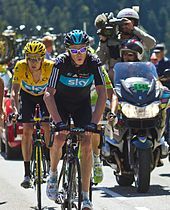 ^ "Chris Froome defends yellow from the front on Mont Ventoux". VeloNews. Competitor Group, Inc. 14 July 2013. Retrieved 16 July 2013. ^ "Chris Froome wins time trial to extend Tour de France lead". BBC Sport. BBC. 17 July 2013. Retrieved 17 July 2013. ^ Fotheringham, William (20 July 2013). "Chris Froome on verge of Tour de France glory after penultimate stage". The Observer. Guardian Media Group. Retrieved 20 July 2013. ^ a b c "Tour de France: Chris Froome wins 100th edition of race". BBC Sport. BBC. 21 July 2013. Retrieved 21 July 2013. ^ Wynn, Nigel (23 July 2013). "Chris Froome tops latest UCI WorldTour ranking". Cycling Weekly. IPC Media. Retrieved 24 July 2013. ^ "Chris Froome: Tour de France leader 'sad' at doping questions". BBC Sport. BBC. 15 July 2013. Retrieved 21 July 2013. ^ "Tour de France: Chris Froome's data offered to Wada by Brailsford". BBC Sport. BBC. 18 July 2013. Retrieved 21 July 2013. ^ a b Wynn, Nigel (30 October 2013). "Chris Froome wins 2013 Velo d'Or award". Cycling Weekly. Time Inc. UK. Retrieved 30 October 2013. ^ Puddocombe, Stephen (23 February 2014). "Chris Froome wins 2014 Tour of Oman". Cycling Weekly. IPC Media. ^ a b "Froome withdraws from Tirreno-Adriatico". Cyclingnews.com. Immediate Media Company. Retrieved 30 November 2015. ^ Farrand, Stephen (4 May 2014). "Froome dominates the final time trial". Cyclingnews.com. Future plc. Retrieved 4 May 2014. ^ "Chris Froome cycles through the Channel Tunnel". The Daily Telegraph. Telegraph Media Group. 7 July 2014. Retrieved 3 March 2015. ^ De Graaf, Mia (7 July 2014). "Are you sure this is the right way Chris? Tour de France favourite Froome becomes the first person ever to cycle UNDER the sea from England to France in channel tunnel". Daily Mail. DMG Media. Retrieved 3 March 2015. ^ "Chris Froome abandons Tour de France after defending champion and Team Sky leader crashes for third time in two days". Daily Mail. DMG Media. 9 July 2014. Retrieved 10 July 2014. ^ Benson, Daniel (2 September 2014). "Vuelta a España: Quintana crashes out of race lead in time trial". Cyclingnews.com. Future plc. Retrieved 13 September 2014. ^ Wynn, Nigel (13 September 2014). "Alberto Contador wins final Vuelta a España mountain test". Cycling Weekly. Time Inc. UK. Retrieved 13 September 2014. ^ Cossins, Peter (14 September 2014). "Contador seals overall 2014 Vuelta a España victory". Cyclingnews.com. Future plc. Retrieved 14 September 2014. ^ Fotheringham, Alasdair (18 February 2015). "Vuelta a Andalucia: Froome loses time to Contador in first showdown". Cyclingnews.com. Immediate Media Company. Retrieved 30 November 2015. ^ "Froome happy despite losing to Contador at Vuelta a Andalucia". Cyclingnews.com. Immediate Media Company. 20 February 2015. Retrieved 30 November 2015. ^ "Chris Froome takes lead of Ruta del Sol after beating Contador on stage four". Sky Sports. BSkyB. 21 February 2015. Retrieved 3 December 2015. ^ "Chris Froome beats Alberto Contador to Ruta del Sol title". BBC sport. BBC. 22 February 2015. Retrieved 3 December 2015. ^ a b Fotheringham, Alasdair (22 February 2015). "Froome seals morale boosting victory over Contador in Andalucia". Cyclingnews.com. Immediate Media Company. Retrieved 3 December 2015. ^ "Valverde wins La Fleche Wallonne 2015". Cyclingnews.com. Future plc. 22 April 2015. Retrieved 22 April 2015. ^ O'Shea, Sadhbh (3 May 2015). "Zakarin wins Tour de Romandie". Cyclingnews.com. Future plc. Retrieved 3 May 2015. ^ "Chris Froome eyes Critérium du Dauphiné victory after stage seven win". The Observer. Guardian Media Group. Associated Press. 13 June 2015. Retrieved 14 June 2015. ^ "Froome wins finale and overall title at Critérium du Dauphiné". Cyclingnews.com. Future plc. 14 June 2015. Retrieved 14 June 2015. ^ "Tour de France 2015 – Stage 3". ProCyclingStats. Retrieved 30 November 2015. ^ "Tour de France 2015 – Stage 4". ProCyclingStats. Retrieved 30 November 2015. ^ Clarke, Stuart (10 July 2015). "Chris Froome will not wear the Tour de France yellow jersey". Cycling Weekly. Time Inc. UK. Retrieved 30 November 2015. ^ "Tour de France: Froome's data files believed to be hacked". Cyclingnews.com. Immediate Media Company. 14 July 2015. Retrieved 30 November 2015. ^ "Tour de France 2015 – Stage 10". ProCyclingStats. Retrieved 30 November 2015. ^ "Porte says that he was 'punched' in the Pyrenees". VeloNews. Competitor Group, Inc. 18 July 2015. Retrieved 30 November 2015. ^ Brady, Enda (19 July 2015). "Froome: Spectator Threw Urine In My Face". Sky News. BSkyB. Retrieved 30 November 2015. ^ Cary, Tom (19 July 2015). "Chris Froome maintains lead but French press continue to attack Team Sky". The Daily Telegraph. Telegraph Media Group. Retrieved 30 November 2015. ^ Fletcher, Patrick (24 July 2015). "Sky's release of Froome's Tour de France data fails to clear the air". Cyclingnews.com. Immediate Media Company. Retrieved 30 November 2015. ^ Farrand, Stephen (23 July 2015). "UCI check Froome's bike and five others for hidden motors at Tour de France". Cyclingnews.com. Immediate Media Company. Retrieved 30 November 2015. ^ Fotheringham, William (25 July 2015). "Chris Froome set for Tour de France win despite Nairo Quintana's attack". theguardian.com. Retrieved 26 July 2015. ^ Duff, Alex (26 July 2015). "Chris Froome Wins Tour de France for Second Time in Three Years". Bloomberg.com. Retrieved 26 July 2015. ^ Benson, Daniel (10 August 2015). "Chris Froome on Team Sky's provisional Vuelta a España roster". Cyclingnews.com. Immediate Media Company. Archived from the original on 12 August 2015. Retrieved 10 August 2015. ^ Clarke, Stuart (11 August 2015). "Chris Froome at the Vuelta a España is icing on the cake, says organiser". Cycling Weekly. Time Inc. UK. Retrieved 14 August 2015. ^ Fotheringham, Alasdair (31 August 2015). "Froome's Vuelta a España back on track on Cumbre del Sol". Cyclingnews.com. Immediate Media Company. Retrieved 3 September 2015. ^ "Froome: 'Andorra will be the toughest Grand Tour stage I've ever done'". Cyclingnews.com. Immediate Media Company. 2 September 2015. Retrieved 3 September 2015. ^ "Froome out of the Vuelta a España after checks reveal a fracture in his foot". Cyclingnews.com. Immediate Media Company. 3 September 2015. Retrieved 3 September 2015. ^ "Froome targeting 2016 Tour de France and Rio Olympics double -- Briton aiming for road race and time trial gold medal in Brazil plus third Tour title". Cycling News. 1 October 2015. ^ "Chris Froome wins Jayco Herald Sun Tour". Cycling News. 8 February 2016. ^ Fotheringham, Alasdair (27 March 2016). "Team Sky delighted with Chris Froome progress ahead of Tour de France bid". independent.co.uk. Retrieved 13 May 2016. ^ Windsor, Richard (28 April 2016). "Nairo Quintana takes overall lead at Tour de Romandie as Chris Froome suffers". Cycling Weekly. Retrieved 13 May 2016. ^ Windsor, Richard (30 April 2016). "Chris Froome takes breakaway victory on Tour de Romandie stage four". Cycling Weekly. Retrieved 13 May 2016. ^ "Criterium du Dauphine: Chris Froome wins third title". BBC Sport. Retrieved 13 June 2016. ^ "Tour de France 2016: Chris Froome claims stage win and lead after stage eight". bbc.co.uk. BBC Sport. 9 July 2016. Retrieved 23 July 2017. ^ Telegraph Sport (10 July 2016). "Chris Froome fined for elbowing spectator in face on the way to stage-eight Tour de France victory". The Daily Telegraph. Retrieved 23 July 2017. ^ "Tour de France: Chris Froome forced to run up Mont Ventoux after crash". BBC Sports. BBC. ^ "Chris Froome coasts home as André Greipel wins Tour's final stage". Guardian. 24 July 2016. Retrieved 26 July 2016. ^ "Rio Olympics 2016: Chris Froome wins bronze in men's time trial". BBC. 10 August 2016. Retrieved 10 August 2016. ^ Fotheringham, William (23 July 2017). "Chris Froome wins fourth Tour de France after Champs Élysées procession". The Guardian. ^ "Chris Froome aiming to end 22-year wait for Vuelta a Espana and Tour double". The Guardian. 27 July 2017. Retrieved 11 September 2017. ^ "Chris Froome attacks and takes Vuelta a España lead as Vincenzo Nibali wins stage three". Cycling Weekly. 21 August 2017. Retrieved 11 September 2017. ^ Sky, Team. "Team take third at TTT worlds - Team Sky". www.teamsky.com. ^ Sky, Team. "Froome captures bronze in Worlds TT - Team Sky". www.teamsky.com. ^ "Froome wins 2017 Velo d'Or - Cyclingnews.com". ^ "What is Prohibited". World Anti-Doping Agency. ^ "WADA will not appeal UCI decision in Christopher Froome case". wada-ama.org. World Anti-Doping Agency. 2 July 2018. Retrieved 2 July 2018. ^ "Chris Froome returns adverse analytical finding for Salbutamol". cyclingnews.com. 13 December 2017. Retrieved 13 December 2017. ^ "What the newest salbutamol study means for Froome". cyclist.co.uk. 11 May 2018. Retrieved 11 May 2018. ^ a b c Pitt, V. (2018, December 6). 'Only Real Men Wear Pink': Chris Froome on how confidence in himself, his team and his audacious attack carried him to his most spectacular win yet, at the Giro d'Italia. Cycling Weekly, pp. 12-16. ^ Ingle S., and Kerner M. (13 December 2017). "Chris Froome fights to save career after failed drugs test result". Guardian Newspaper. Retrieved 29 December 2017. ^ "Brailsford: At this moment we totally back Chris Froome | Cyclingnews.com". Cyclingnews.com. Retrieved 2 May 2018. ^ "UCI statement on anti-doping proceedings involving Mr Christopher Froome". uci.org. Union Cycliste Internationale. 2 July 2018. Retrieved 2 July 2018. ^ "Chris Froome confirms Giro d'Italia participation - Cyclingnews.com". ^ "Chris Froome to make season debut at Ruta del Sol | Cyclingnews.com". Cyclingnews.com. Retrieved 2 May 2018. ^ "Director of Ruta del Sol welcomes Chris Froome | Cyclingnews.com". Cyclingnews.com. Retrieved 2 May 2018. ^ "Vegni: I can't stop Chris Froome racing the Giro d'Italia | Cyclingnews.com". Cyclingnews.com. Retrieved 2 May 2018. ^ "Vegni: I can't stop Chris Froome racing the Giro d'Italia - Cyclingnews.com". ^ "Chris Froome crashes in Giro d'Italia time trial recon - Cyclingnews.com". ^ Cary, Tom (4 May 2018). "Chris Froome crashes... before Giro d'Italia even starts" – via www.telegraph.co.uk. ^ a b c Pryde, Kenny (31 May 2018). "Inside line: Froome was overweight, in pain and thinking of quitting". Rouleur. Retrieved 6 June 2018. ^ "Giro d'Italia 2018 - Stage 6". www.procyclingstats.com. ^ "Giro d'Italia 2018 - Stage 14". www.procyclingstats.com. ^ "Giro d'Italia 2018 - Stage 15". www.procyclingstats.com. ^ "Giro d'Italia 2018 - Stage 16 (ITT)". www.procyclingstats.com. ^ "Giro d'Italia 2018 - Stage 18". www.procyclingstats.com. ^ Fordyce, Tom (6 June 2018). "How Chris Froome won Giro d'Italia thanks to 'spectacular' stage 19 victory". bbc.co.uk. Retrieved 6 June 2018. ^ "Giro d'Italia 2018 - Stage 19". www.procyclingstats.com. ^ "Chris Froome: I have a clear conscience - Cyclingnews.com". ^ "Chris Froome wins Giro d'Italia in Rome to join cycling's exclusive club". Guardian. 27 May 2018. Retrieved 31 May 2018. ^ Bevan, Chris (20 July 2013). "Chris Froome's fiancee on life with the Tour de France leader". BBC Sport. BBC. Retrieved 23 July 2013. ^ White, Jim (23 July 2013). "How Chris Froome's feisty fiancee is the power behind his throne". The Daily Telegraph. Telegraph Media Group. Retrieved 23 July 2013. ^ Smith, Sophie (16 December 2014). "Chris Froome working on long-haul strategy towards 2015 Tour de France". Cycling Weekly. Time Inc. UK. Retrieved 19 December 2014. ^ "Chris Froome celebrates birth of first child". Cyclingnews.com. Immediate Media Company. 16 December 2015. Retrieved 16 December 2015. ^ Moore, Richard (4 December 2015). "The Hardest Road". Esquire. Hearst Magazines. Retrieved 4 December 2015. ^ "What the best bike racer on the planet ate for breakfast today at the Tour de France". Business Insider. Retrieved 1 June 2017. ^ "After Chris Froome cut back on carbs for more protein, he lost 20 pounds, started winning the Tour de France, and became a millionaire". Business Insider. Retrieved 31 May 2017. ^ "Chris Froome is using these weird chainrings, and they might be helping him win a historic 3rd Tour de France". Business Insider. Retrieved 31 May 2017. ^ a b c "Chris Froome". Cycling Archives. de Wielersite. Retrieved 9 March 2013. ^ "Christopher Froome". Tour de France. Amaury Sport Organisation. Archived from the original on 2 July 2013. Retrieved 28 June 2013. ^ "Velo Magazine – December 2013". VeloNews. Competitor Group, Inc. 19 November 2013. Retrieved 20 November 2013. ^ Axelgaard, Emil (18 October 2013). "Van Avermaet and Froome win 'Flandrian of the Year' award". CyclingQuotes.com. JJnet.dk A/S. Retrieved 13 September 2014. ^ "Froome, Cockroft and England women cricketers take SJA prizes – Sports Journalists' Association". www.sportsjournalists.co.uk. Brailsford, Dave; Froome, Chris (2013). The Pain and the Glory: The Official Team Sky Diary of the Giro Campaign and Tour Victory. London: HarperCollins. ISBN 978-0-00-754471-4. Froome, Chris (2014). The Climb: The Autobiography. London: Penguin Books. ISBN 0-241-00418-7. Sharp, David (2013). Va Va Froome: The Remarkable Rise of Chris Froome. Edinburgh: Birlinn. ISBN 978-1-78027-166-8. Vlismas, Michael (2013). Froome: The Ride of his Life. Johannesburg: Jonathan Ball Publishers. ISBN 978-1-86842-604-1. Walsh, David (2013). Inside Team Sky: The Inside Story of Team Sky and their Challenge for the 2013 Tour de France. New York City: Simon & Schuster. ISBN 978-1-4711-3331-2. 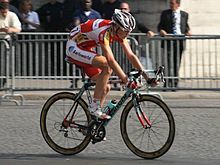 Wikimedia Commons has media related to Chris Froome.